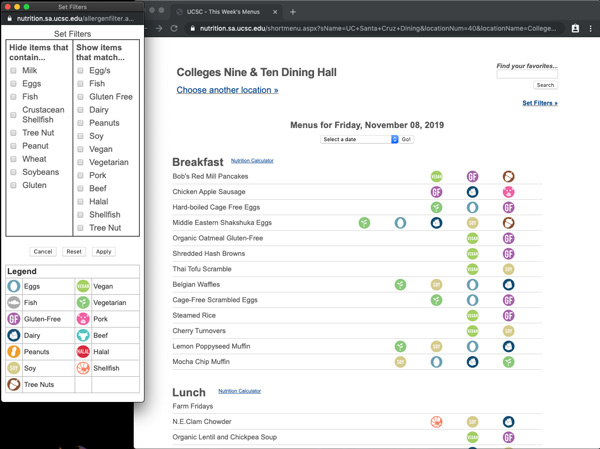 UCSC Dining uses colored icons to identify foods that contain the most common allergens. These icons, shown below, are used on our online menus and on the signs in the dining halls. Although we do our best to meet the needs of students with food allergies, our facilities are not gluten-free or allergen-free. If you have a food allergy that is not represented by one of the icons below, please schedule a visit with your nearest dining hall manager; they will support you in having a safe dining experience. A system of icons is used on the online menus and on signs at food stations in the dining halls to indicate the most common food allergens and other dietary choices. Whether you have a food allergy, religious food preferences, a vegan/vegetarian diet, or simply need assistance with your food selections, we can provide the resources to help you make delicious choices, safely and easily. We work with students who have food allergies or intolerances, and other special dietary needs, to make sure they get the most from their dining experience. We encourage students to talk with our dining hall managers about specific dietary restrictions. Dining hall managers are knowledgeable about the options available and can show you which foods will work with your diet. The online allergen filter can show you the menu items that do or do not contain specific allergens for each dining hall location. UC Santa Cruz is committed to access and inclusion in its campus programs and services. Dining Services works in close partnership with students and the Disability Resource Center (DRC) to ensure equal access to UC Santa Cruz Dining facilities. Students with medical and/or disability-related concerns regarding food and dining access are encouraged to meet with a dining hall manager. Dining hall managers are knowledgeable about the food options available and can recommend which foods will work with specific diets. Students whose food access needs are not met by dining hall managers are encouraged to meet with Clint Jeffries, the Assistant Director of Dining Services. Clint works with students to discuss their specific needs and determine how to best address the concerns. Accommodations to dining services may require collaboration between the student, dining staff, and the Disability Resource Center and documentation from a qualified professional to be considered. Interactive nutrition facts for all of our meals are available through the online menus. You can use the meal calculator to check calorie counts and plan a whole day's eating. Additionally, each dining hall displays printed signs next to each entree or side dish identifying ingredients, nutrition content, allergens, and vegan or vegetarian choices. Certain religious practices restrict dietary intake and necessitate close attention to recipe ingredients. The most commonly restricted foods are certain types of meat, fish, and dairy. We use a comprehensive food labeling system to help guests identify the use of such foods. 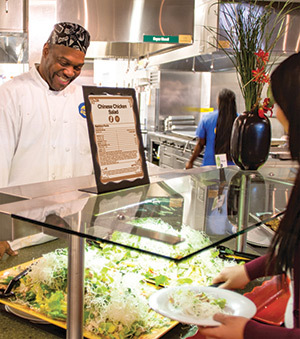 UC Santa Cruz Dining offers vegan and vegetarian options at every meal and at every dining hall every day! Our community is comprised of those with varied dietary lifestyles; we are keenly aware of this and work hard to offer a wide selection of delicious vegetarian, dairy-free, and vegan dining options at every meal. Check out the menus to see what we're serving today! We offer a variety of foods from different cultures. These dishes let students enjoy favorite meals from their childhood to help them feel comfortable and "at home" on campus, and provide variety so other students can try something new. If there are foods you would like to see in the dining halls, fill out a comment card. We welcome your suggestions!